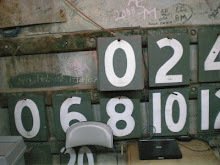 Behind the Scoreboard: Toyko Dome Again?! The World Baseball Classic got underway this morning with a game featuring Japan vs. China. While no, I didn't get up at 4:30 am to watch it, I hear that Japan defended it's 2006 crown with a win. 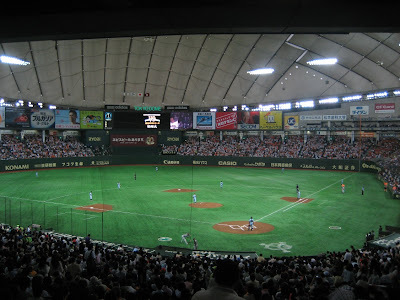 As has become typical for all MLB-related games in Japan, the game was played at the Tokyo Dome, a 1988-vintage eyesore that makes the old Seattle Kingdome look like a palace. The outside is kinda cool in a modern kind of way, but the inside is so ugly that it's practically hard to watch the game. With all of the world watching, one has to wonder, is this really the best stadium Japan's got? Looking into this matter, in fact it may not be far off. 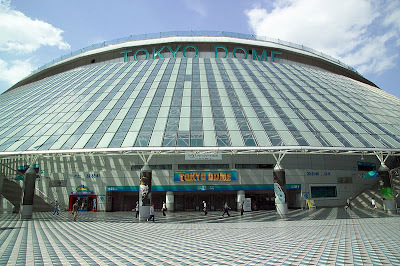 Japan seems to have a thing for domes, as there are few large outdoor stadiums and there certainly hasn't been a building boom of new nostalgic-style parks like there has been in the US. 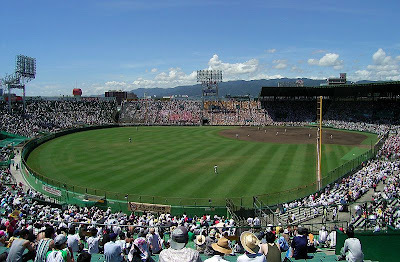 However, there is one gem, Koshien Stadium in Nishinomiya, Japan about 4 hours from Tokyo. 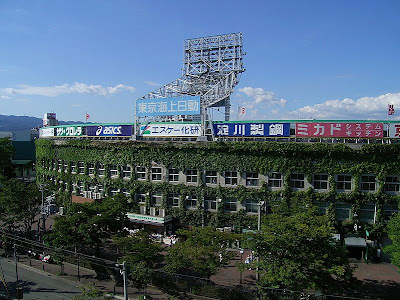 Built in 1924 it's considered the Wrigley Field of Japan, complete with ivy on the walls (this time on the outside rather than the inside). It's a shame the games couldn't be played there. Why not? Of course, it's located in a relatively small town (pop~400,000) instead of the massive Toyko, and I'm sure that plays a part. Also, the city has roughly the climate of Washington, DC and the average high temperature at this time of year is only about 50 degrees, which probably would make day games a necessity, potentially driving down attendance. Still, if the WBC finals are ever played in Japan as it has been wishing for, it would be late enough in the spring that the weather would permit play. If so, it should be requirement that the game is played outdoors as it was meant to be at a historic ballpark like Koshien Stadium.